Understand how to make the transition from a specific purpose to a series of main points. Explain how to prepare meaningful main points. Understand how to choose the best organizational pattern, or combination of patterns, for a specific speech. Understand how to use a variety of strategies to help audience members keep up with a speech’s content: internal previews, internal summaries, and signposts. 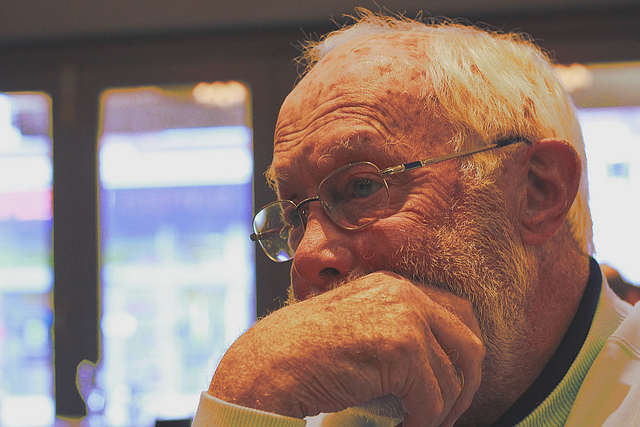 Siddie Nam – Thinking – CC BY-NC-ND 2.0. In a series of ground-breaking studies conducted during the 1950s and 1960s, researchers started investigating how a speech’s organization was related to audience perceptions of those speeches. The first study, conducted by Raymond Smith in 1951, randomly organized the parts of a speech to see how audiences would react. Not surprisingly, when speeches were randomly organized, the audience perceived the speech more negatively than when audiences were presented with a speech with a clear, intentional organization. Smith also found that audiences who listened to unorganized speeches were less interested in those speeches than audiences who listened to organized speeches (Smith, 1951). Thompson furthered this investigation and found that it was harder for audiences to recall information after an unorganized speech. Basically, people remember information from speeches that are clearly organized, and they forget information from speeches that are poorly organized (Thompson, 1960). A third study by Baker found that when audiences were presented with a disorganized speaker, they were less likely to be persuaded, and saw the disorganized speaker as lacking credibility (Baker, 1965). These three critical studies make the importance of organization very clear. When speakers are organized they are perceived as credible. When speakers are not organized, their audiences view the speeches negatively, are less likely to be persuaded, and don’t remember specific information from the speeches after the fact. We start this chapter by discussing these studies because we want you to understand the importance of speech organization to real audiences. This chapter will help you learn organization so that your speech with have its intended effect. In this chapter, we are going to discuss the basics of organizing the body of your speech. While speeches take many different forms, they are often discussed as having an introduction, a body, and a conclusion. The introduction establishes the topic and wets your audience’s appetite, and the conclusion wraps everything up at the end of your speech. The real “meat” of your speech happens in the body. In this section, we’re going to discuss how to think strategically about structuring the body of your speech. We like the word strategic because it refers to determining what is essential to the overall plan or purpose of your speech. Too often, new speakers throw information together and stand up and start speaking. When that happens, audience members are left confused, and the reason for the speech may get lost. To avoid being seen as disorganized, we want you to start thinking critically about the organization of your speech. In this section, we will discuss how to take your speech from a specific purpose to creating the main points of your speech. Before we discuss how to determine the main points of your speech, we want to revisit your speech’s specific purpose, which we discussed in detail in Chapter 4 “Topic, Purpose, and Thesis”. Recall that a speech can have one of three general purposes: to inform, to persuade, or to entertain. The general purpose refers to the broad goal for creating and delivering the speech. The specific purpose, on the other hand, starts with one of those broad goals (inform, persuade, or entertain) and then further informs the listener about the who, what, when, where, why, and how of the speech. Specific Purpose To inform a group of school administrators about the various open-source software packages that could be utilized in their school districts. Specific Purpose To persuade a group of college students to make the switch from Microsoft Office to the open-source office suite OpenOffice. Specific Purpose To entertain members of a business organization with a mock eulogy of for-pay software giants as a result of the proliferation of open-source alternatives. In each of these three examples, you’ll notice that the general topic is the same, open-source software, but the specific purpose is different because the speech has a different general purpose and a different audience. Before you can think strategically about organizing the body of your speech, you need to know what your specific purpose is. If you have not yet written a specific purpose for your current speech, please go ahead and write one now. Once you’ve written down your specific purpose, you can start thinking about the best way to turn that specific purpose into a series of main points. Main points are the key ideas you present to enable your speech to accomplish its specific purpose. In this section, we’re going to discuss how to determine your main points and how to organize those main points into a coherent, strategic speech. Main Points are the key ideas you present to enable your speech to accomplish its specific purpose. How Many Main Points Do I Need? While there is no magic number for how many main points a speech should have, speech experts generally agree that the fewer the number of main points the better. First and foremost, experts on the subject of memory have consistently shown that people don’t tend to remember very much after they listen to a message or leave a conversation (Bostrom & Waldhart, 1988). While many different factors can affect a listener’s ability to retain information after a speech, how the speech is organized is an important part of that process (Dunham, 1964; Smith, 1951; Thompson, 1960). For the speeches you will be delivering in a typical public speaking class, you will usually have just two or three main points. If your speech is less than three minutes long, then two main points will probably work best. If your speech is between three and ten minutes in length, then it makes more sense to use three main points. You may be wondering why we are recommending only two or three main points. The reason comes straight out of the research on listening. According to LeFrancois, people are more likely to remember information that is meaningful, useful, and of interest to them; different or unique; organized; visual; and simple (LeFrancois, 1999). Two or three main points are much easier for listeners to remember than ten or even five. In addition, if you have two or three main points, you’ll be able to develop each one with examples, statistics, or other forms of support. Including support for each point will make your speech more interesting and more memorable for your audience. Brainstorming List of Points Define open-source software. List and describe the software commonly used by school districts. Explain the advantages of using open-source software. Explain the disadvantages of using open-source software. Review the history of open-source software. Describe the value of open-source software. Describe some educational open-source software packages. Review the software needs of my specific audience. Describe some problems that have occurred with open-source software. Now that you have brainstormed and developed a list of possible points, how do you go about narrowing them down to just two or three main ones? Remember, your main points are the key ideas that help build your speech. When you look over the preceding list, you can then start to see that many of the points are related to one another. Your goal in narrowing down your main points is to identify which individual, potentially minor points can be combined to make main points. This process is called chunking because it involves taking smaller chunks of information and putting them together with like chunks to create more fully developed chunks of information. Before reading our chunking of the preceding list, see if you can determine three large chunks out of the list (note that not all chunks are equal). Chunking involves taking smaller chunks of information and putting them together with like chunks to create more fully developed chunks of information. Main Point 1 School districts use software in their operations. Main Point 2 What is open-source software? Main Point 3 Name some specific open-source software packages that may be appropriate for these school administrators to consider. You may notice that in the preceding list, the number of subpoints under each of the three main points is a little disjointed or the topics don’t go together clearly. That’s all right. Remember that these are just general ideas at this point. It’s also important to remember that there is often more than one way to organize a speech. Some of these points could be left out and others developed more fully, depending on the purpose and audience. We’ll develop the preceding main points more fully in a moment. Now that we’ve discussed how to take a specific purpose and turn it into a series of main points, here are some helpful hints for creating your main points. Suppose you added a fourth main point about open-source software for musicians—would this fourth main point go with the other three? Probably not. While you may have a strong passion for open-source music software, that main point is extraneous information for the speech you are giving. It does not help accomplish your specific purpose, so you’d need to toss it out. The next question to ask yourself about your main points is whether they overlap too much. While some overlap may happen naturally because of the singular nature of a specific topic, the information covered within each main point should be clearly distinct from the other main points. Imagine you’re giving a speech with the specific purpose “to inform my audience about the health reasons for eating apples and oranges.” You could then have three main points: that eating fruits is healthy, that eating apples is healthy, and that eating oranges is healthy. While the two points related to apples and oranges are clearly distinct, both of those main points would probably overlap too much with the first point “that eating fruits is healthy,” so you would probably decide to eliminate the first point and focus on the second and third. On the other hand, you could keep the first point and then develop two new points giving additional support to why people should eat fruit. One of the biggest mistakes some speakers make is to spend most of their time talking about one of their main points, completely neglecting their other main points. To avoid this mistake, organize your speech to spend roughly the same amount of time on each main point. If you find that one of your main points is simply too large, you may need to divide that main point into two main points and consolidate your other main points into a single main point. Let’s see if our preceding example is balanced (school districts use software in their operations; what is open-source software; name some specific open-source software packages that may be appropriate for these school administrators to consider). What do you think? The answer depends on how much time a speaker will have to talk about each of these main points. If you have an hour to speak, then you may find that these three main points are balanced. However, you may also find them wildly unbalanced if you only have five minutes to speak because five minutes is not enough time to even explain what open-source software is. If that’s the case, then you probably need to rethink your specific purpose to ensure that you can cover the material in the allotted time. Another major question to ask yourself about your main points is whether or not they have a parallel structure. By parallel structure, we mean that you should structure your main points so that they all sound similar. When all your main points sound similar, it’s easier for your audiences to remember your main points and retain them for later. Let’s look at our sample (school districts use software in their operations; what is open-source software; name some specific open-source software packages that may be appropriate for these school administrators to consider). Notice that the first and third main points are statements, but the second one is a question. We have an example here of main points that are not parallel in structure. You could fix this in one of two ways. You could make them all questions: what are some common school district software programs; what is open-source software; and what are some specific open-source software packages that may be appropriate for these school administrators to consider. Or you could turn them all into statements: school districts use software in their operations; define and describe open-source software; name some specific open-source software packages that may be appropriate for these school administrators to consider. Either of these changes will make the grammatical structure of the main points parallel. Parallel structure means structuring your main points so that they all sound similar. The last question you want to ask yourself about your main points is whether the main points make sense in the order you’ve placed them. The next section goes into more detail of common organizational patterns for speeches, but for now, we want you to think logically about the flow of your main points. When you look at your main points, can you see them as progressive, or does it make sense to talk about one first, another one second, and the final one last? If you look at your order, and it doesn’t make sense to you, you probably need to think about the flow of your main points. Often, this process is an art and not a science. But let’s look at a couple of examples. Main Point 1 History of school dress codes. Main Point 2 Problems with school dress codes. Main Point 3 Eliminating school dress codes. Main Point 1 Why should states have rider laws? Main Point 2 What are the effects of a lack of rider laws? Main Point 3 What is rider law legislation? When you look at these two examples, what are your immediate impressions of the two examples? In the first example, does it make sense to talk about history, and then the problems, and finally how to eliminate school dress codes? Would it make sense to put history as your last main point? Probably not. In this case, the main points are in a logical sequential order. What about the second example? Does it make sense to talk about your solution, then your problem, and then define the solution? Not really! What order do you think these main points should be placed in for a logical flow? Maybe you should explain the problem (lack of rider laws), then define your solution (what is rider law legislation), and then argue for your solution (why states should have rider laws). Notice that in this example you don’t even need to know what “rider laws” are to see that the flow didn’t make sense. 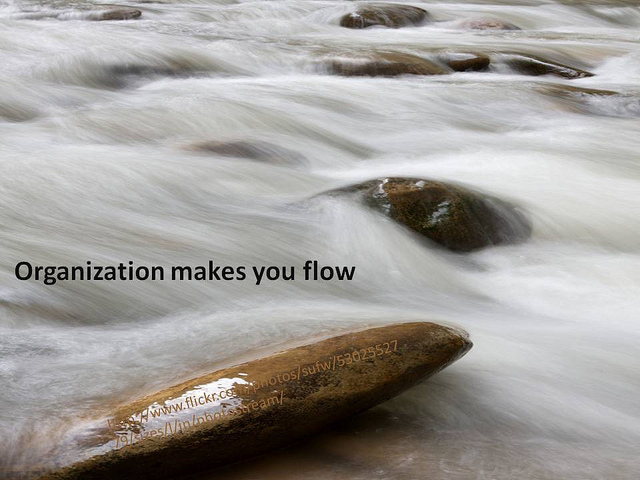 Twentyfour Students – Organization makes you flow – CC BY-SA 2.0. Previously in this chapter, we discussed how to make your main points flow logically. This section is going to provide you with organization patterns to help you create a logically organized speech. The first organization pattern we’ll discuss is categorical/topical. Specific Purpose To persuade a group of high school juniors to apply to attend Generic University. Main Points I. Life in the dorms. II. Life in the classroom. Specific Purpose To inform a group of college students about the uses and misuses of Internet dating. Main Points I. Define and describe Internet dating. II. Explain some strategies to enhance your Internet dating experience. III. List some warning signs to look for in potential online dates. In this speech, the speaker is talking about how to find others online and date them. Specifically, the speaker starts by explaining what Internet dating is; then the speaker talks about how to make Internet dating better for her or his audience members; and finally, the speaker ends by discussing some negative aspects of Internet dating. Again, notice that the information is chunked into three categories or topics and that the second and third could be reversed and still provide a logical structure for your speech. Specific Purpose To inform a group of physicians about Drug X, a newer drug with similar applications to Drug Y. Main Points I. Show how Drug X and Drug Y are similar. II. Show how Drug X and Drug Y differ. Main Points I. Explain the basic purpose and use of both Drug X and Drug Y.
II. Show how Drug X and Drug Y are similar. III. Show how Drug X and Drug Y differ. If you were using the comparison/contrast pattern for persuasive purposes, in the preceding examples, you’d want to make sure that when you show how Drug X and Drug Y differ, you clearly state why Drug X is the better choice for physicians to adopt. In essence, you’d want to make sure that when you compare the two drugs, you show that Drug X has all the benefits of Drug Y, but when you contrast the two drugs, you show how Drug X is superior to Drug Y in some way. The spatial speech pattern organizes information according to how things fit together in physical space. This pattern is best used when your main points are oriented to different locations that can exist independently. The primary reason to choose this format is to show that the main points have specific locations. We’ll look at two examples here, one involving physical geography and one involving a different spatial order. Specific Purpose To inform a group of history students about the states that seceded from the United States during the Civil War. Main Points I. Locate and describe the Confederate states just below the Mason-Dixon Line (Virginia, North Carolina, and Tennessee). II. Locate and describe the Confederate states in the deep South (South Carolina, Georgia, Alabama, Mississippi, and Florida). III. Locate and describe the western Confederate states (Louisiana, Arkansas, and Texas). If you look at a basic map of the United States, you’ll notice that these groupings of states were created because of their geographic location to one another. In essence, the states create three spatial territories to explain. Now let’s look at a spatial speech unrelated to geography. Specific Purpose To explain to a group of college biology students how the urinary system works. Main Points I. Locate and describe the kidneys and ureters. II. Locate and describe the bladder. III. Locate and describe the sphincter and urethra. In this example, we still have three spatial areas. If you look at a model of the urinary system, the first step is the kidney, which then takes waste through the ureters to the bladder, which then relies on the sphincter muscle to excrete waste through the urethra. All we’ve done in this example is create a spatial speech order for discussing how waste is removed from the human body through the urinary system. It is spatial because the organization pattern is determined by the physical location of each body part in relation to the others discussed. The chronological speech pattern places the main idea in the time order in which items appear—whether backward or forward. Here’s a simple example. Specific Purpose To inform my audience about the books written by Winston Churchill. Main Points I. Examine the style and content of Winston Churchill’s writings prior to World War II. II. Examine the style and content of Winston Churchill’s writings during World War II. III. Examine the style and content of Winston Churchill’s writings after World War II. In this example, we’re looking at the writings of Winston Churchill in relation to World War II (before, during, and after). By placing his writings into these three categories, we develop a system for understanding this material based on Churchill’s own life. Note that you could also use reverse chronological order and start with Churchill’s writings after World War II, progressing backward to his earliest writings. As you might guess, the biographical speech pattern is generally used when a speaker wants to describe a person’s life. You could speak about your own life, the life of someone they know personally, or the life of a famous person. By the nature of this speech organizational pattern, these speeches tend to be informative or entertaining; they are usually not persuasive. Let’s look at an example. Specific Purpose To inform my audience about the early life of Marilyn Manson. Main Points I. Describe Brian Hugh Warner’s early life and the beginning of his feud with Christianity. II. Describe Warner’s stint as a music journalist in Florida. III. Describe Warner’s decision to create Marilyn Manson and the Spooky Kids. In this example, we see how Brian Warner, through three major periods of his life, ultimately became the musician known as Marilyn Manson. In this example, these three stages are presented in chronological order, but the biographical pattern does not have to be chronological. For example, it could compare and contrast different periods of the subject’s life, or it could focus topically on the subject’s various accomplishments. The causal speech pattern is used to explain cause-and-effect relationships. When you use a causal speech pattern, your speech will have two basic main points: cause and effect. In the first main point, typically you will talk about the causes of a phenomenon, and in the second main point, you will then show how the causes lead to either a specific effect or a small set of effects. Let’s look at an example. Main Points I. Explain the history and prevalence of drinking alcohol among Native Americans. II. Explain the effects that abuse of alcohol has on Native Americans and how this differs from the experience of other populations. In this case, the first main point is about the history and prevalence of drinking alcohol among Native Americans (the cause). The second point then examines the effects of Native American alcohol consumption and how it differs from other population groups. However, a causal organizational pattern can also begin with an effect and then explore one or more causes. In the following example, the effect is the number of arrests for domestic violence. Main Points I. Explain that there are significantly more arrests for domestic violence in our city than in cities of comparable size in our state. II. List possible causes for the difference, which may be unrelated to the actual amount of domestic violence. In this example, the possible causes for the difference might include stricter law enforcement, greater likelihood of neighbors reporting an incident, and police training that emphasizes arrests as opposed to other outcomes. Examining these possible causes may suggest that despite the arrest statistic, the actual number of domestic violence incidents in your city may not be greater than in other cities of similar size. Another format for organizing distinct main points in a clear manner is the problem-cause-solution speech pattern. In this format, you describe a problem, identify what you believe is causing the problem, and then recommend a solution to correct the problem. Specific Purpose To persuade a civic group to support a citywide curfew for individuals under the age of eighteen. Main Points I. Demonstrate that vandalism and violence among youth is having a negative effect on our community. II. Show how vandalism and violence among youth go up after 10:00 p.m. in our community. III. Explain how instituting a mandatory curfew at 10:00 p.m. would reduce vandalism and violence within our community. In this speech, the speaker wants to persuade people to pass a new curfew for people under eighteen. To help persuade the civic group members, the speaker first shows that vandalism and violence are problems in the community. Once the speaker has demonstrated the problem, the speaker then explains to the audience that the cause of this problem is youth outside after 10:00 p.m. Lastly, the speaker provides the mandatory 10:00 p.m. curfew as a solution to the vandalism and violence problem within the community. The problem-cause-solution format for speeches generally lends itself to persuasive topics because the speaker is asking an audience to believe in and adopt a specific solution. A further way to organize your main ideas within a speech is through a psychological speech pattern in which “a” leads to “b” and “b” leads to “c.” This speech format is designed to follow a logical argument, so this format lends itself to persuasive speeches very easily. Let’s look at an example. Specific Purpose To persuade a group of nurses to use humor in healing the person. Main Points I. How laughing affects the body. II. How the bodily effects can help to heal. III. Strategies for using humor in healing. In this speech, the speaker starts by discussing how humor affects the body. If a patient is exposed to humor (a), then the patient’s body actually physiologically responds in ways that help to heal (b—e.g. reduces stress, decreases blood pressure, bolsters one’s immune system, etc.). Because of these benefits, nurses should engage in humor use that helps with healing (c). The categorical/topical speech pattern creates categories (or chunks) of information that go together to help support your original specific purpose. The comparison/contrast speech pattern uses main points to compare an contrast two similar objects, topics, or ideas. The spatial speech pattern organizes information according to how things fit together in physical space. The chronological speech pattern places the main idea in the time order in which items appear—whether backward or forward. The biographical speech pattern is generally used when a speaker wants to describe a person’s life. The causal speech pattern is used to explain cause-and-effect relationships. When you use a causal speech pattern, your speech will have two basic main points: cause and effect. The problem-cause-solution speech pattern describes a problem, identifies what is causing the problem, and then recommends a solution to correct the problem. The psychological speech pattern is a format in which “a” leads to “b” and “b” leads to “c.” This speech pattern is designed to follow a logical argument. Each of the preceding organizational patterns is potentially useful for organizing the main points of your speech. However, not all organizational patterns work for all speeches. For example, as we mentioned earlier, the biographical pattern is useful when you are telling the story of someone’s life. Some other patterns, particularly comparison/contrast, problem-cause-solution, and psychological, are well suited for persuasive speaking. Your challenge is to choose the best pattern for the particular speech you are giving. You will want to be aware that it is also possible to combine two or more organizational patterns to meet the goals of a specific speech. For example, you might wish to discuss a problem and then compare/contrast several different possible solutions for the audience. Such a speech would thus be combining elements of the comparison/contrast and problem-cause-solution patterns. When considering which organizational pattern to use, you need to keep in mind your specific purpose as well as your audience and the actual speech material itself to decide which pattern you think will work best. Chris Marquardt – REWIND – CC BY-SA 2.0. Have you ever been listening to a speech or a lecture and found yourself thinking, “I am so lost!” or “Where the heck is this speaker going?” Chances are one of the reasons you weren’t sure what the speaker was talking about was that the speaker didn’t effectively keep the speech moving. When we are reading and encounter something we don’t understand, we can reread the paragraph and try to make sense of what we’re trying to read. Unfortunately, we are not that lucky when it comes to listening to a speaker. 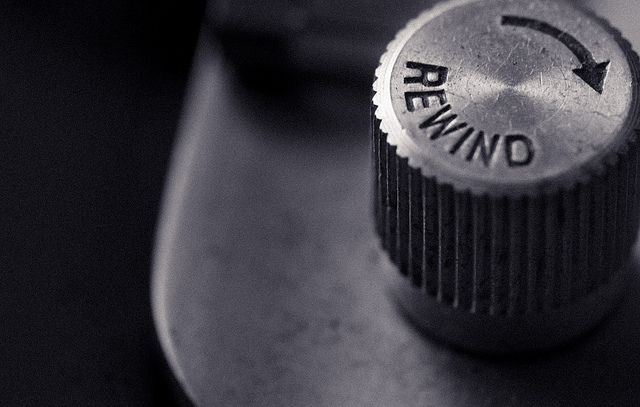 We cannot pick up our universal remote and rewind the person. For this reason, speakers need to think about how they keep a speech moving so that audience members are easily able to keep up with the speech. In this section, we’re going to look at four specific techniques speakers can use that make following a speech much easier for an audience: transitions, internal previews, internal summaries, and signposts. Now that we’ve seen the problems caused by lack of adolescent curfew laws, let’s examine how curfew laws could benefit our community. Thus far we’ve examined the history and prevalence of alcohol abuse among Native Americans, but it is the impact that this abuse has on the health of Native Americans that is of the greatest concern. Now that we’ve thoroughly examined how these two medications are similar to one another, we can consider the many clear differences between the two medications. Although he was one of the most prolific writers in Great Britain prior to World War II, Winston Churchill continued to publish during the war years as well. You’ll notice that in each of these transition examples, the beginning phrase of the sentence indicates the conclusion of a period of time (now that, thus far) or main point. Table 2: Transition Words contains a variety of transition words that will be useful when keeping your speech moving. Beyond transitions, there are several other techniques that you can use to clarify your speech organization for your audience. The next sections address several of these techniques, including internal previews, internal summaries, and signposts. An internal preview is a phrase or sentence that gives an audience an idea of what is to come within a section of a speech. An internal preview works similarly to the preview that a speaker gives at the end of a speech introduction, quickly outlining what he or she is going to talk about (i.e. the speech’s three main body points). In an internal preview, the speaker highlights what he or she is going to discuss within a specific main point during a speech. To help us further understand why recycling is important, we will first explain the positive benefits of recycling and then explore how recycling can help our community. When an audience hears that you will be exploring two different ideas within this main point, they are ready to listen for those main points as you talk about them. In essence, you’re helping your audience keep up with your speech. Rather than being given alone, internal previews often come after a speaker has transitioned to that main topic area. Using the previous internal preview, let’s see it along with the transition to that main point. Now that we’ve explored the effect that a lack of consistent recycling has on our community, let’s explore the importance of recycling for our community (transition). To help us further understand why recycling is important, we will first explain the positive benefits of recycling and then explore how recycling can help our community (internal preview). While internal previews are definitely helpful, you do not need to include one for every main point of your speech. In fact, we recommend that you use internal previews sparingly to highlight only the main points containing relatively complex information. Whereas an internal preview helps an audience know what you are going to talk about within a main point at the beginning, an internal summary is delivered to remind an audience of what they just heard within the speech. In general, internal summaries are best used when the information within a specific main point of a speech was complicated. To write your own internal summaries, look at the summarizing transition words in Table 2: Transition Words Let’s look at an example. To sum up, school bullying is a definite problem. Bullying in schools has been shown to be detrimental to the victim’s grades, the victim’s scores on standardized tests, and the victim’s future educational outlook. In this example, the speaker was probably talking about the impact that bullying has on an individual victim educationally. Of course, an internal summary can also be a great way to lead into a transition to the next point of a speech. In this section, we have explored how bullying in schools has been shown to be detrimental to the victim’s grades, the victim’s scores on standardized tests, and the victim’s future educational outlook (internal summary). Therefore, schools need to implement campus-wide, comprehensive anti-bullying programs (transition). While not sounding like the more traditional transition, this internal summary helps readers summarize the content of that main point. The sentence that follows than leads to the next major part of the speech, which is going to discuss the importance of anti-bullying programs. The first function of credibility is competence. The second function of credibility is trustworthiness. The final function of credibility is caring/goodwill. Signposts are meant to help your audience keep up with your speech, so the more simplistic your signposts are, the easier it is for your audience to follow. In addition to helping audience members keep up with a speech, signposts can also be used to highlight specific information the speaker thinks is important. Where the other signposts were designed to show the way (like highway markers), signposts that call attention to specific pieces of information are more like billboards. Words and phrases that are useful for highlighting information can be found in Table 2: Transition Words under the category “emphasis.” All these words are designed to help you call attention to what you are saying so that the audience will also recognize the importance of the information. A transition is a phrase or sentence that indicates that a speaker is moving from one main point to another main point in a speech. An internal preview is a phrase or sentence that gives an audience an idea of what is to come within a section of a speech. An internal summary is delivered to remind an audience of what they just heard within the speech. A signpost is a guide a speaker gives their audience to help the audience keep up with the content of a speech. Ausubel, D. P. (1968). Educational psychology. New York, NY: Holt, Rinehart, & Winston. Baker, E. E. (1965). The immediate effects of perceived speaker disorganization on speaker credibility and audience attitude change in persuasive speaking. Western Speech, 29, 148–161. Bostrom, R. N., & Waldhart, E. S. (1988). Memory models and the measurement of listening. Communication Education, 37, 1–13. Dunham, J. R. (1964). Voice contrast and repetition in speech retention (Doctoral dissertation). Retrieved from: http://etd.lib.ttu.edu/theses. LeFrancois, G. R. (1999). Psychology for teaching (10th ed.). Belmont, CA: Wadsworth. Smith, R. G. (1951). An experimental study of the effects of speech organization upon attitudes of college students. Speech Monographs, 18, 292–301. Thompson, E. C. (1960). An experimental investigation of the relative effectiveness of organizational structure in oral communication. Southern Speech Journal, 26, 59–69.